19th century photograph of Mrs. Boughton of Brooklyn, New York, a friend of Sarah (McGeorge) Charlock, to whom, according to information on the reverse, Mrs. Boughton sold a Victorian love seat and large rocker when she moved from Brooklyn. I don't have information on the identity of Mrs. Boughton. 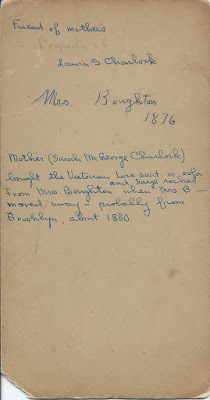 Perhaps a reader has done research on the Boughton, McGeorge and/or Charlock families and can make a connection. Sarah Ann McGeorge was born about March 1840 at Athens, Pennsylvania, daughter of Robert Leslie McGeorge and Betsey McGeorge. On 11 September 1867, at Washington, D.C., Sarah married James Cornelius Charlock, son of Henry and Charlotte Albin (Nichols) Charlock. James was born 23 July 1838 at Fishkill, New York. 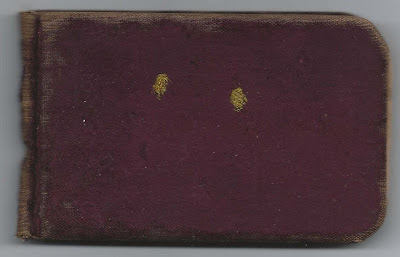 The couple had, I believe, five children, the youngest of whom was Laura S. Charlock, mentioned on the reverse of the photograph as its owner. Laura was born 4 October 1883, at Brooklyn, New York, and died at Bridgeport, Connecticut, in 1977. I don't believe she married. If only I had a photograph of the Victorian love seat and rocker! If you have corrections to the information above or insights regarding the Charlock, McGeorge or Boughton families, please leave a comment or contact me directly. Thanks! 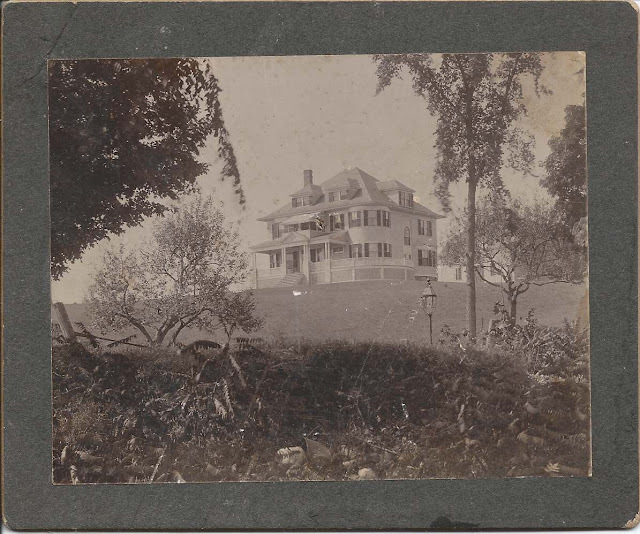 Photograph dated September 1903 of the West Boylston, Massachusetts home of Mrs. Alona Allen (Walker) Hinds and her son Albert Walker Hinds. Alona Allen Walker was born 4 February 1830 at Holden, Massachusetts, daughter of Joel and Deidemia [sp?] (Stone) Walker. 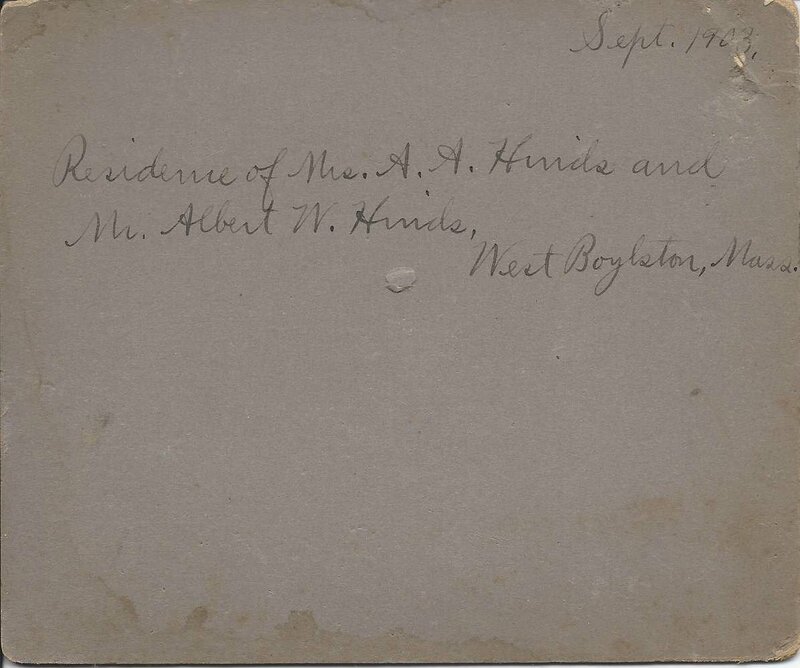 On 31 December 1863 at Sterling, Massachusetts, Alona married Albert H. Hinds, son of Ephraim and Maria (Hapgood) Hinds. Their son Albert Walker Hinds was born 30 November 1964 at West Bolyston, Massachusetts. Albert H. Hinds, a civil engineer, died 28 February 1874. Son Albert Walker Hinds was a teacher and town treasurer. I don't know if he was married early in life but some time after the time of the 1920 Census, he married Margaret, who was born about 1900. If you have corrections and/or additions to the information above or information on the Hinds home, please leave a comment or contact me directly. Thanks! Vintage photograph of the store operated by Ernest W. Voter at Farmington, Maine. 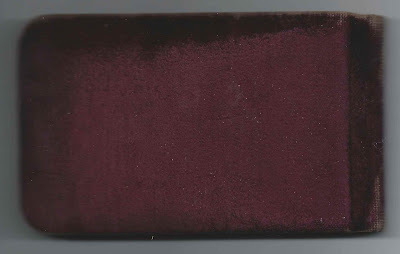 The photograph itself is approximately 7" x 5"; the multi-ply mat enclosing it is about 9-3/4" x 9". There's nothing on the reverse of the mat; the photograph is pasted on inside. Ernest W. Voter was born 5 July 1879 at Farmington, Maine, son of Warren T. and Eliza Ella (Conant) Voter, who were born at Farmington, Maine, and Temple, Maine, respectively. On 18 June 1906 at Wilton, Maine, Ernest W. Voter married Blanche Mabel Foster, daughter of Howard A. and Robena (Canwell) Foster. 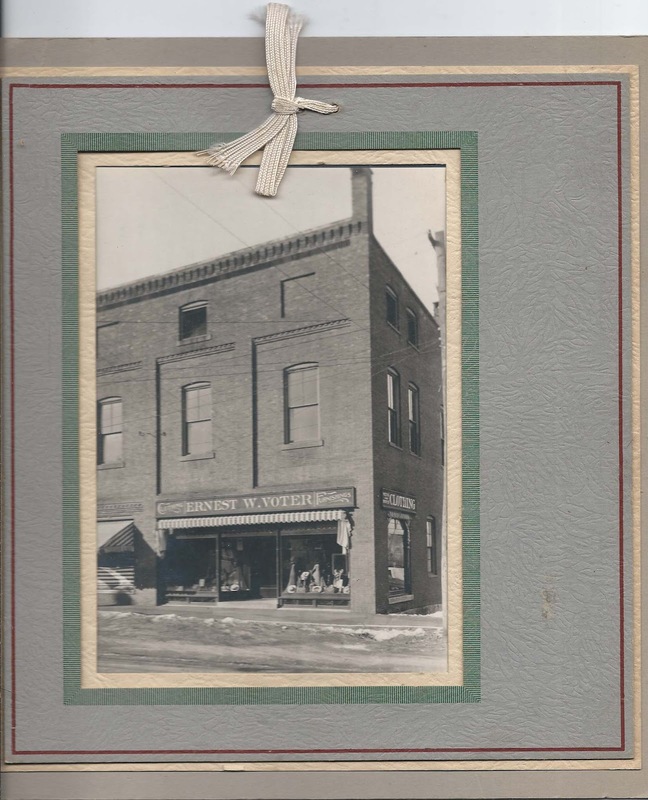 Ernest and Blanche made their home at Farmington, Maine where they raised at least one child, a daughter, operated the Ernest W. Voter store, and participated in town and community affairs. Photograph dated 1904 of 58-year-old Silas Randolph Wallace, Captain of the First Battery of the New Hampshire NS from 1867-1907. 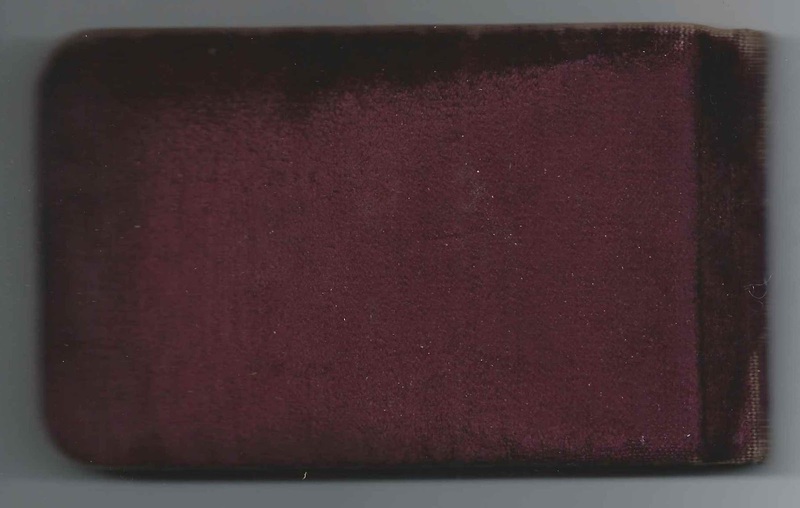 The photograph itself is approximately 5-1/2" x 3-3/4", in a mat with total dimensions of about 10-3/4" x 6-3/4". 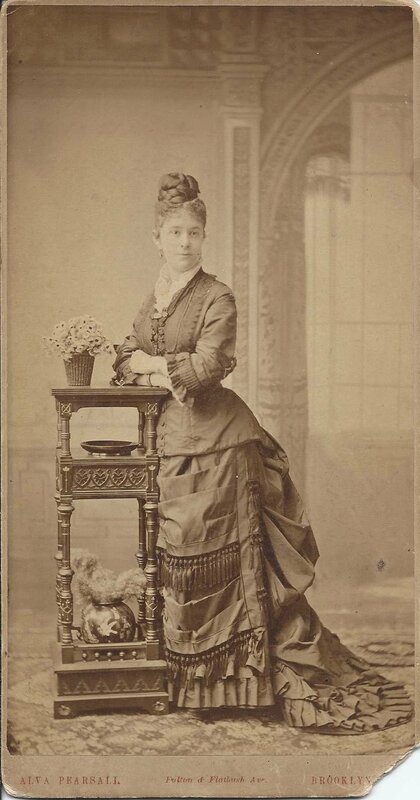 The photograph was taken by the studio of Miss Osgood of Lebanon, New Hampshire. 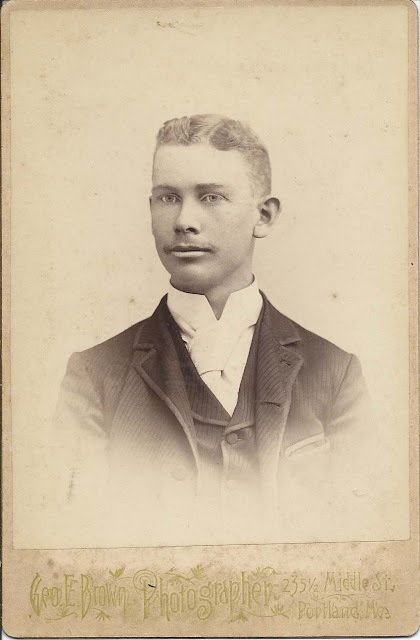 Silas Randolph Wallace was born about July 1846 at Norwich, Vermont, son of George N. and Mary Elizabeth (Wild) Wallace. 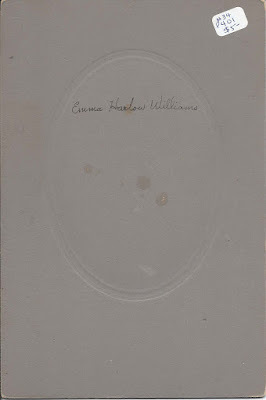 I'm not sure of the parents of George N. Wallace, but Mary Elizabeth (Wild) Wallace was the daughter of Samuel Whitman Wild and Harriet (Pixley) Wild. Silas served in the Civil War. 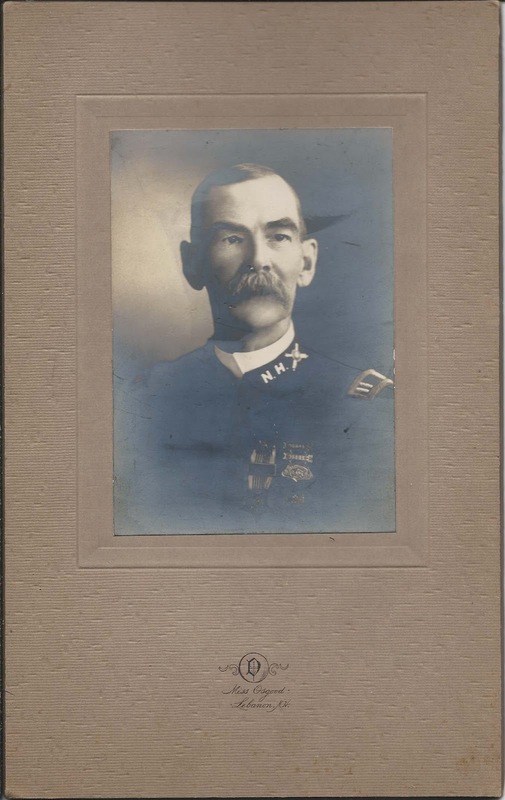 He enlisted as a private in New Hampshire on 22 August 1862 in Company D, New Hampshire 14th Infantry Regiment. He mustered out on 8 July 1865 at Savannah, Georgia. 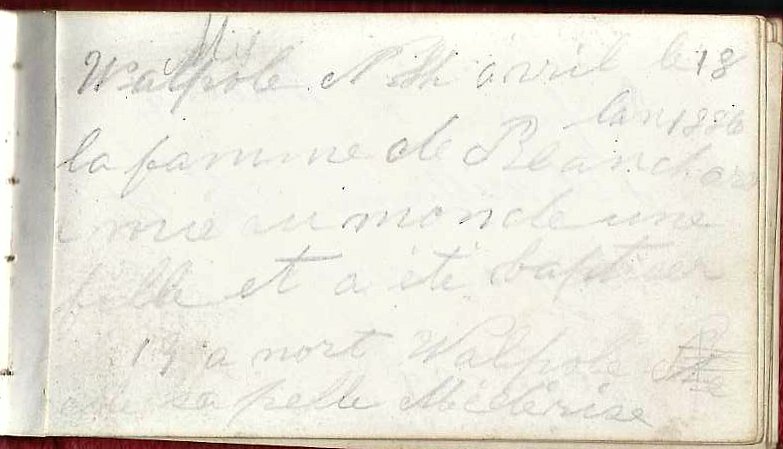 Silas' first marriage, I believe, occurred on 1 May 1869 at Weare, New Hampshire, to Julia A. McCain, daughter of William and Sarah Vickery (Peabody) McCain. Julia died 18 January 1892 at Manchester, New Hampshire. His second marriage occurred on 10 April 1893 at Manchester, New Hampshire, to Ella Adelaide Pratt, daughter of Alvin and Adeline Pratt. Ella died 8 April 1903. 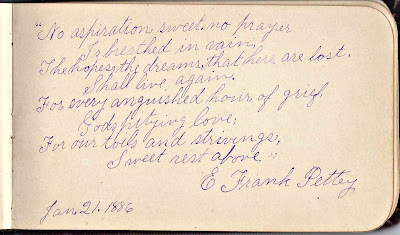 Silas died 7 June 1929 at Northumberland, New Hampshire. I found mention online of a deed that Silas negotiated in 1884. 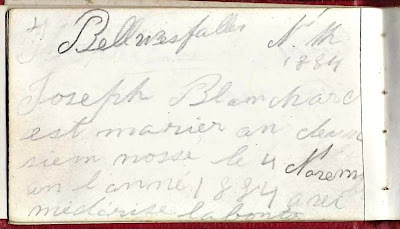 1870s/1880s autograph album that I believe belonged to Joseph T. Blanchard, who was born in Canada and lived for a good portion of his life at Keene, New Hampshire. 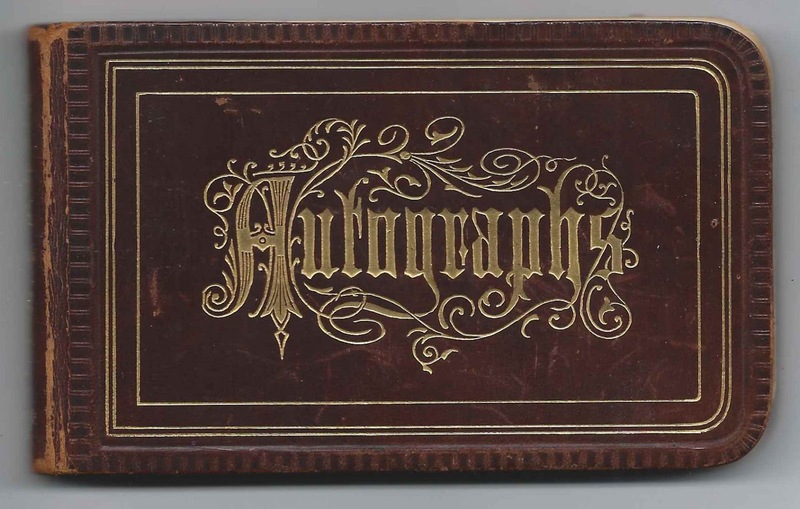 The album is approximately 4" x 2-1/4" and contains over 30 pages signed by the owner and his friends and relatives. The album was a challenge as several names were repeated, and it was hard to tell if the signers were different people or the same person. And I suspect the owner may have gone by one of his given names for part of his life and the other for another part. 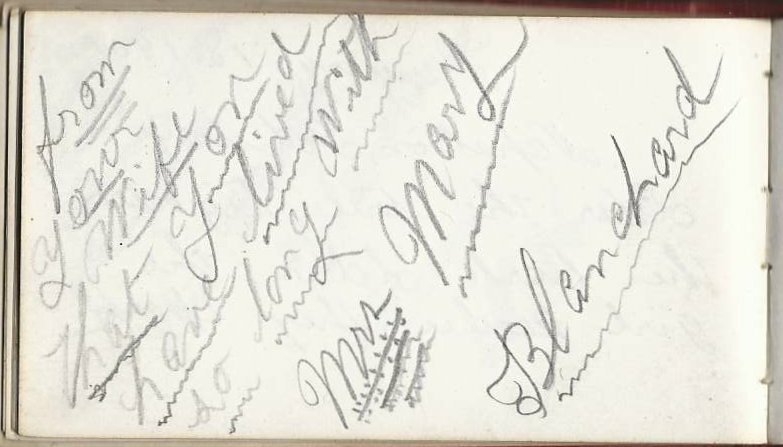 The reason I believe this album belonged to Joseph T. Blanchard is that his wife Mary signed the next to last page. 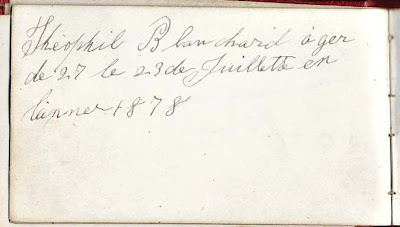 Three pages were signed by a Theophil Blanchard. Perhaps Theophil was Joseph's middle name. 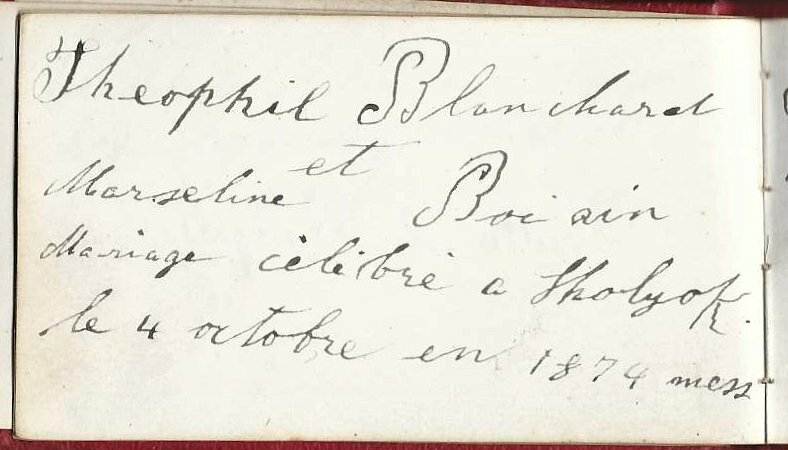 One page was signed in 1878 when Theophil was 27 years old. 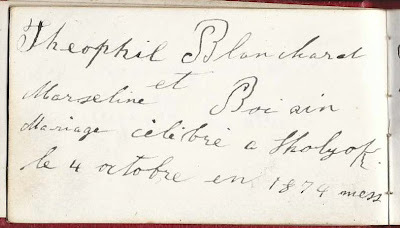 Another page details the 4 October 1874 marriage of Theophil and Marcelline Boivin. Marcelline died 27 May 1875 at Holyoke, Massachusetts. [Marceline Boivin, according to her Massachusetts death record, which states the cause of death as "burned".] I'm thinking that Marceline was one of the many victims of the disastrous fire at Precious Blood Church in South Holyoke, Massachusetts, in May 1875. 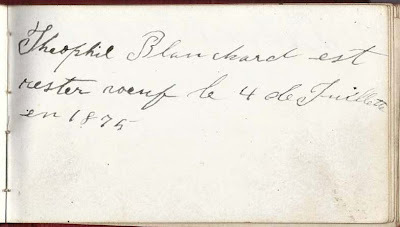 Joseph Blanchard, who, again, might be the same person as Theophil, wrote two pages in the album. 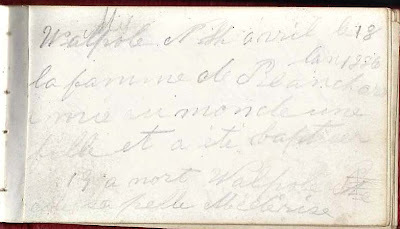 One page details his marriage to Mary Mederise Labonte [Labounty], on 4 November 1884. The other details the birth of their child on 18 April 1886 at Walpole, New Hampshire. 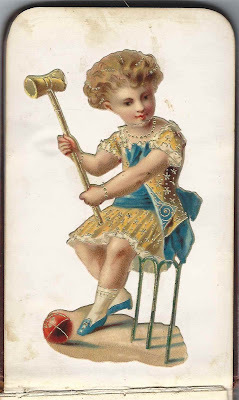 I believe this child was Malvina Mederise Blanchard. 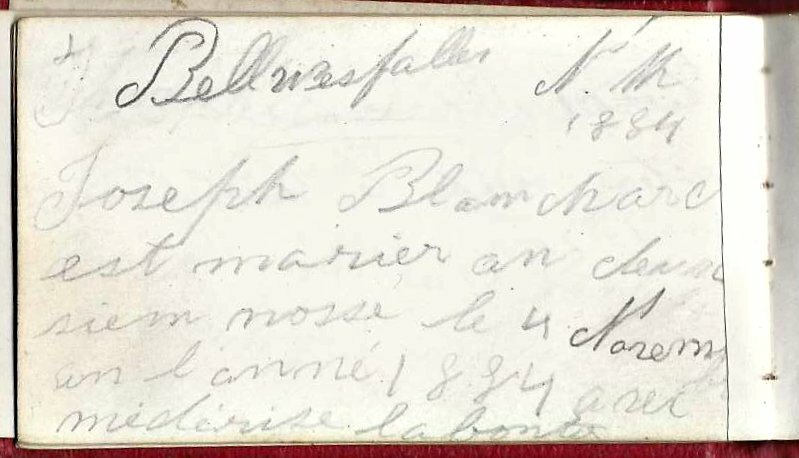 If you have information on the Blanchard, Boivin and/or Labonte/Labounty families, especially if you can confirm that Theophil and Joseph were the same person or not, please leave a comment or contact me directly. Likewise, if you have information on any of the other signers in the album, who are listed below, please leave a comment or contact me directly. Miss Mary Bell of Bellows Falls, Vermont. 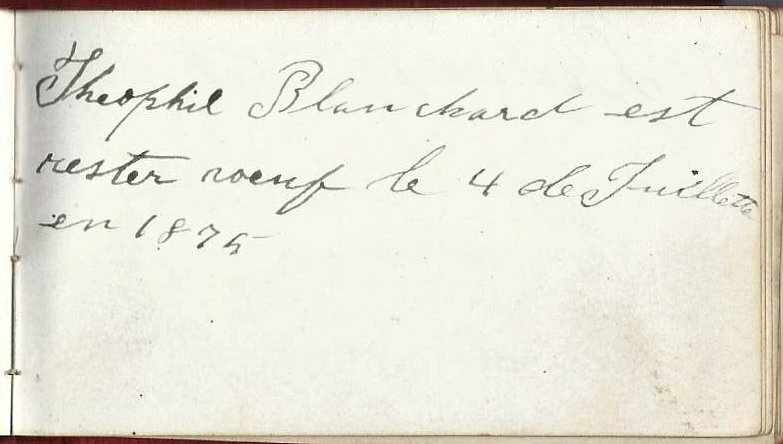 Can't make out her middle initial; could be R.
Theophil Blanchard, could be the same person as above: gives his marriage date of 4 October 1874 and wife's name, Marseline B?. 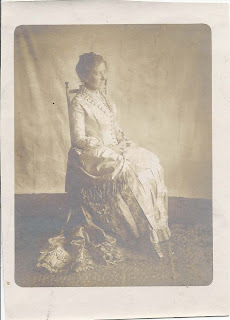 Miss Mamie Blanchard of Keene, New Hampshire. "your daughter". Perhaps Malvina Mederise Blanchard? 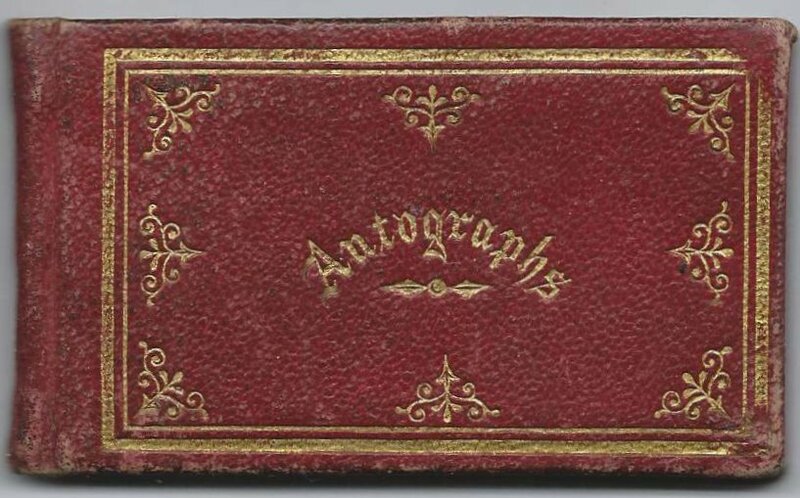 Mrs. Mary Blanchard: "from your wife that you have lived so long with"
Handmade autograph album that belonged to Louise Lincoln, with pages signed in 1878, possibly from people associated with the Carpenter family's straw manufacturing complex at Foxborough, Massachusetts. Louise's name is shown on the front cover, above. The album is approximately 4-1/2" x 2-1/4" inches and contains 26 pages signed by people who identified themselves and some who did not. An alphabetical list of the signers appears at the end of this post. 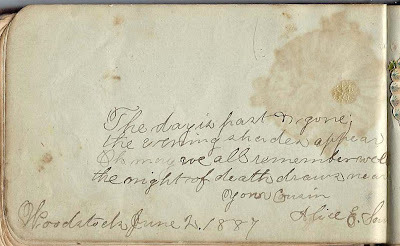 Thanks to reader Ed [see his comment below], I believe Louise may have been Louisa Lincoln, daughter of Emerson and Patience (Hathaway) Lincoln, who were born at Raynham, Massachusetts, and Dighton, Massachusetts respectively. Louisa was born 10 October 1846 at Raynham, Massachusetts. She had two sisters and two brothers. Louisa died at Dighton, Massachusetts, in 1924. I don't believe she ever married. 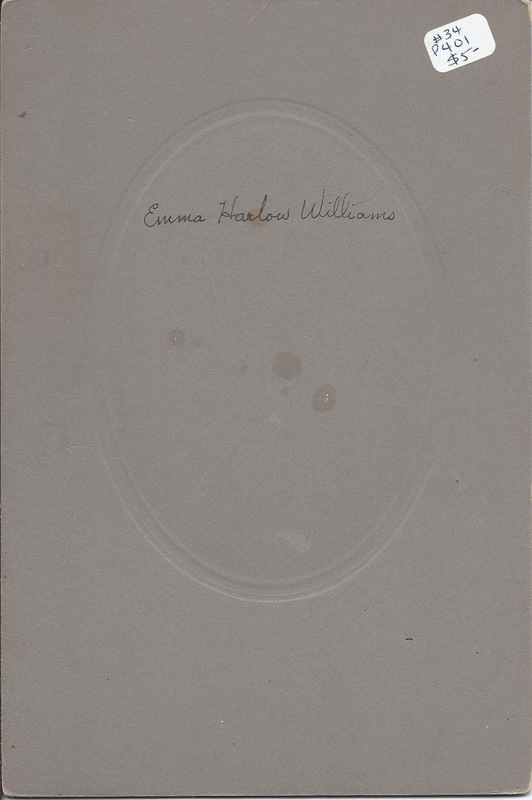 The photograph below was found with the autograph album but I have no way of knowing if the unidentified woman was Louisa Lincoln, another worker at the straw company, a Lincoln relative or a completely unrelated person. 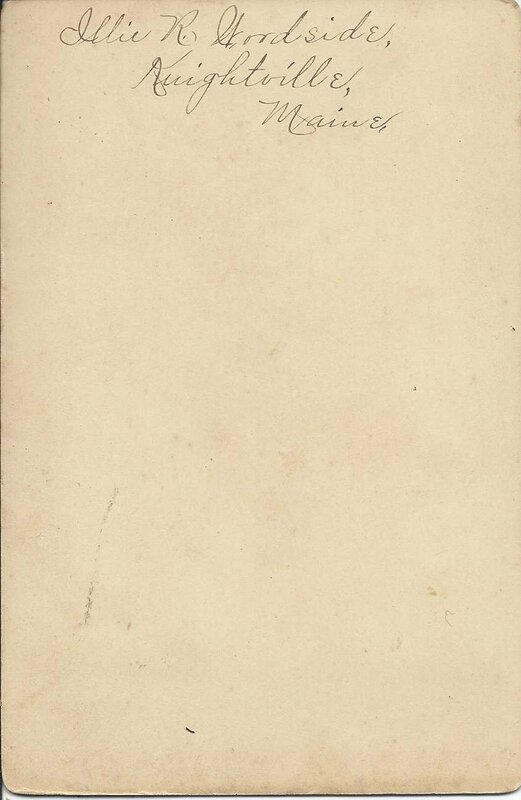 There's nothing on the reverse of the photograph. 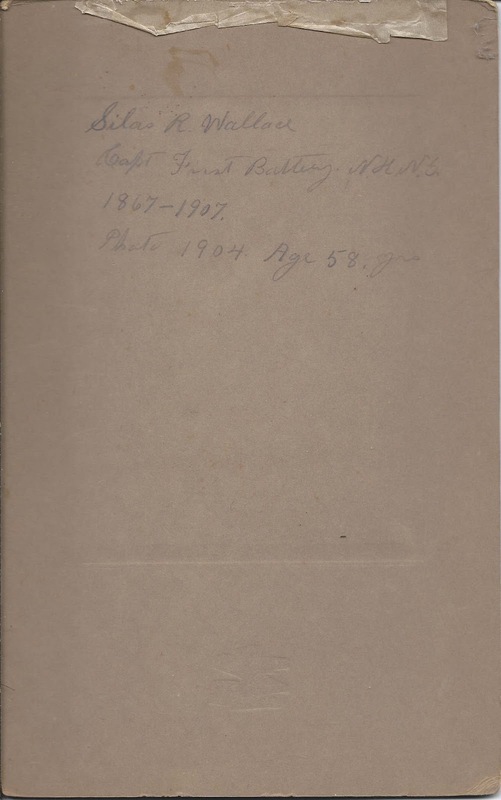 Many pages indicate that they were signed at the "Sewing Hall". Fortunately, one page included "Hamlet Hall", so I was able to make the connection to the O. & W. Carpenter manufacturing facility. Hamlet Hall was built in 1845 to serve as a combination sewing house and dormitory for the young ladies who were attracted to the employment there. Read about the Hamlet House and see a photograph here in Foxborough: Gem of Norfolk County, by Jack Authelet of the Foxborough Historical Society, by entering "Hamlet House" in the search box. As shown in Ed's comment below, Louisa's sister Florence also worked at the straw shop. Several of the women who signed pages in Louise's album gave Maine as their address. Others came from Foxborough and other towns in Massachusetts. 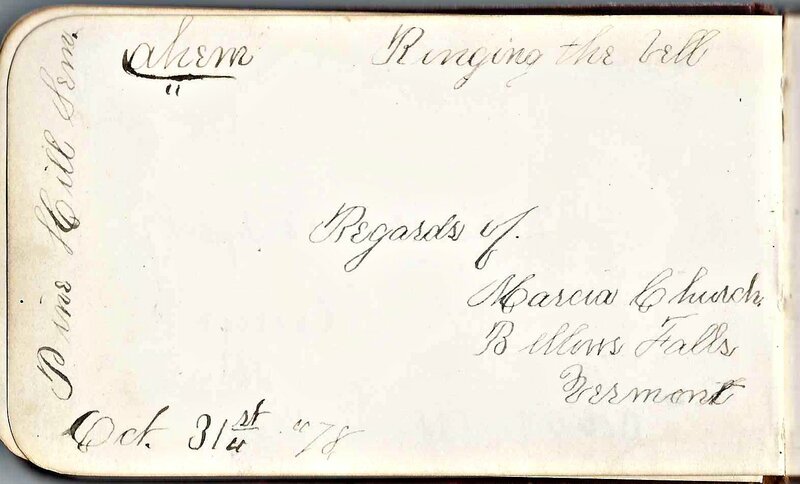 Maria E. Conant of Winterport, Maine, signed a page at Foxboro, Massachusetts in 1878. 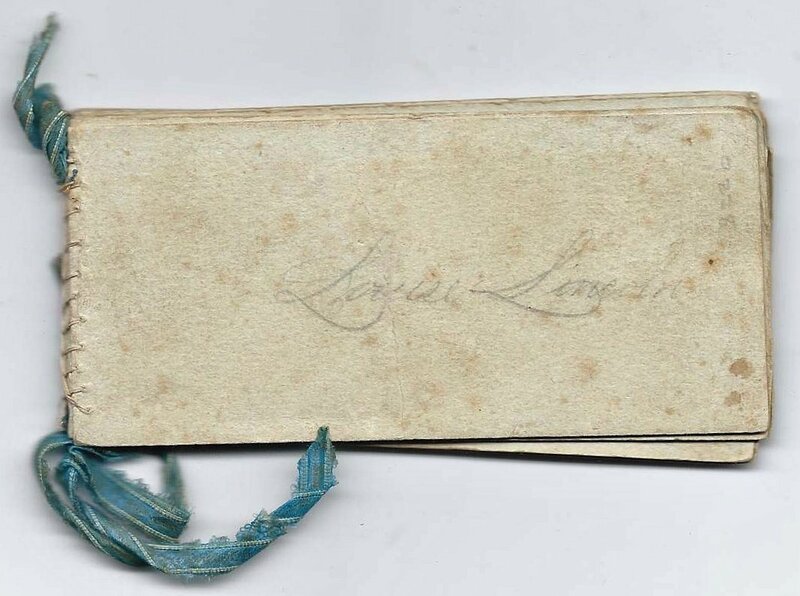 M. Louise Sawtelle of Sidney, Maine, signed a page at Foxboro, Massachusetts, in 1878. 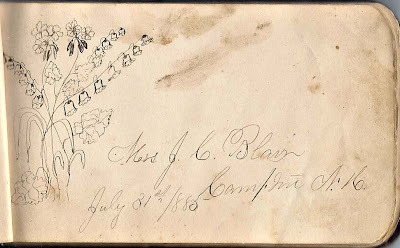 M. Abbie Brown of Prospect Ferry, Maine, signed at page at Foxoboro, Massachusetts, in 1878. 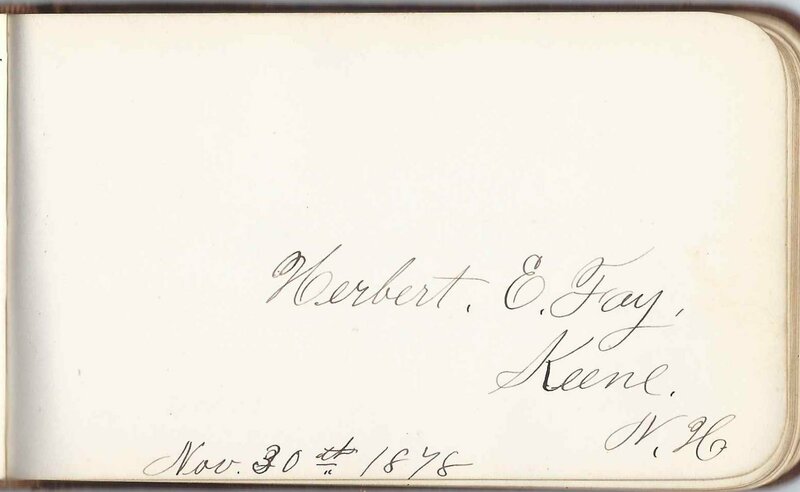 Kate Gleason of Foxboro, Massachusetts, signed at page at the Sewing Hall in 1878. 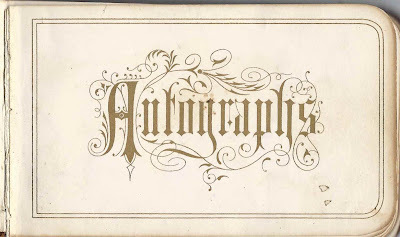 Winnie K. Leonard of West Bridgewater, Massachusetts, signed a page at Foxboro, Massachusetts in 1878. 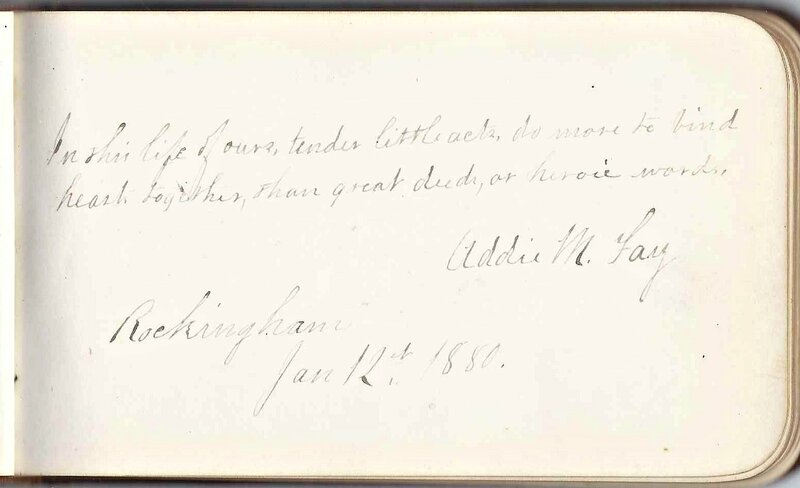 Hattie Lothrop of Taunton, Massachusetts, signed a page at Foxboro, Massachusetts, in 1878. She mentioned the Hamlet House. 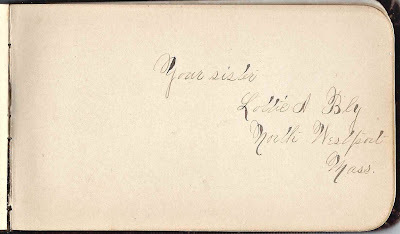 Leland Merrill wrote his name vertically on the page signed by Ella C. Merrill of Taunton, Massachusetts in 1878. 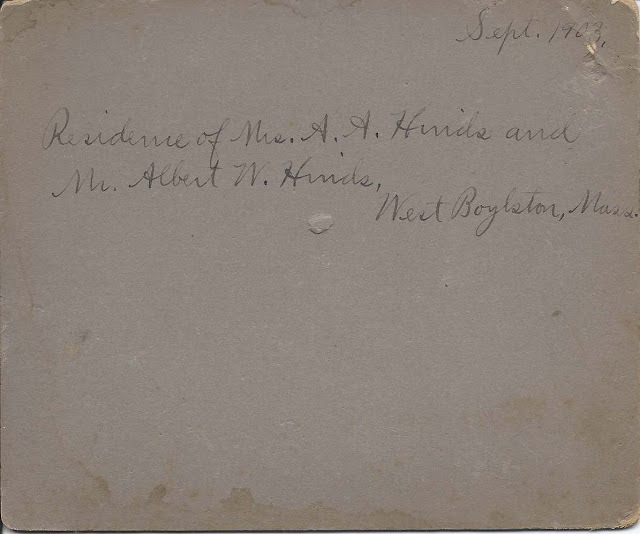 Albert E. Pond signed a page at the Music Hall. If you have a theory as to the identity of Louise Lincoln or insights into the Hamlet House of the Carpenter straw manufacturing complex or into any of the signers listed below, please leave a comment or contact me directly. Thanks! 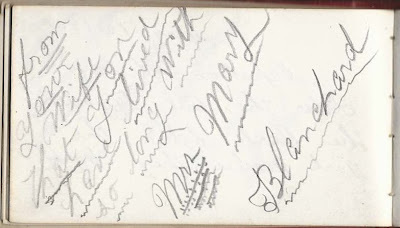 1880s autograph album of Martha Luella Cass, "Mattie", who was living at Woodstock, New Hampshire, when the album was being compiled. 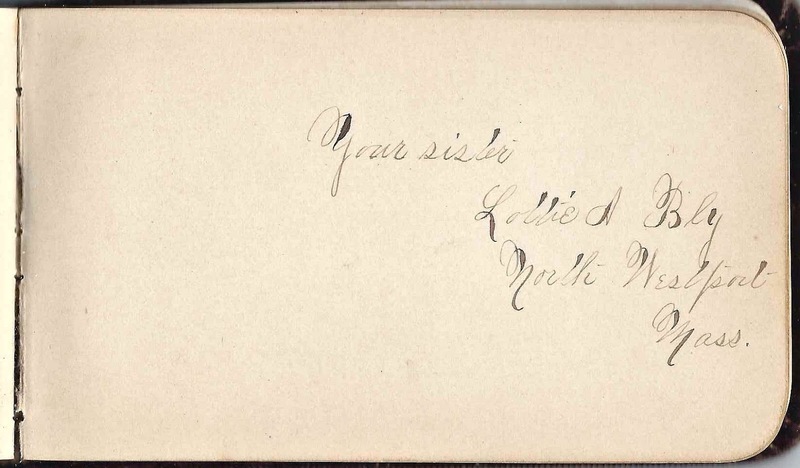 Fortunately, three of Mattie's siblings signed pages in her album and gave their full names and addresses so that Mattie's identification could be made. The album is approximately 5-1/4" x 3-1/4", with over 60 pages signed by Mattie's relatives and friends. An alphabetical list of signers appears at the end of this post. Many of the pages have marriage and death dates of the signers, added later, presumably, by Mattie herself. When I first started scanning this album, I started from what I thought was the front, as that cover had decoration. But the autographs were all upside down. It's possible that the front cover, shown above, had decorations in the area where you see two spots. Martha Luella Cass was born 10 January 1869 at Boston, Massachusetts, the daughter of Augustus A. and Mary Ann (Sawyer) Cass, who were born at Boston, Massachusetts, and Woodstock, New Hampshire, respectively. 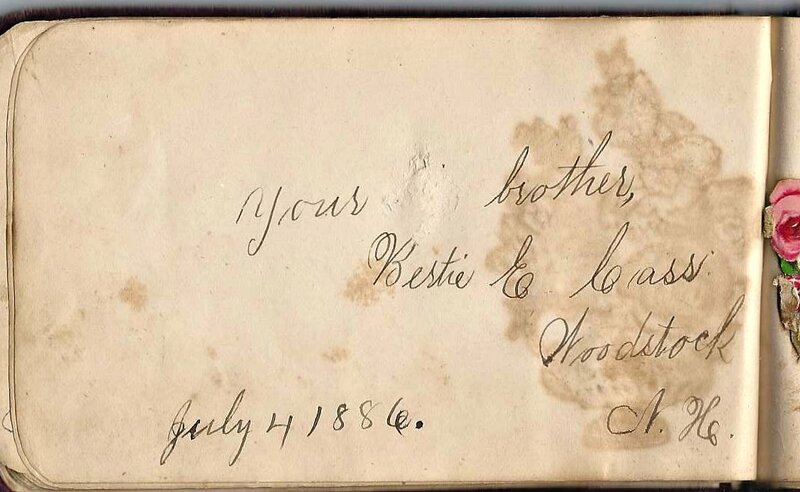 Mattie's brother Edward Bertram Cass signed a page as Bertie E. Cass of Woodstock, New Hampshire, in 1886. 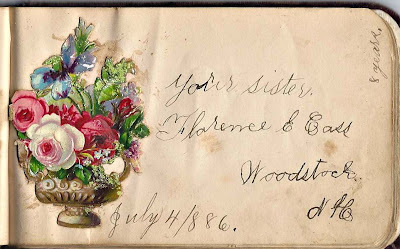 Mattie's sister Florence E. Cass of Woodstock, New Hampshire, signed a page in 1886, when she was eight years old. 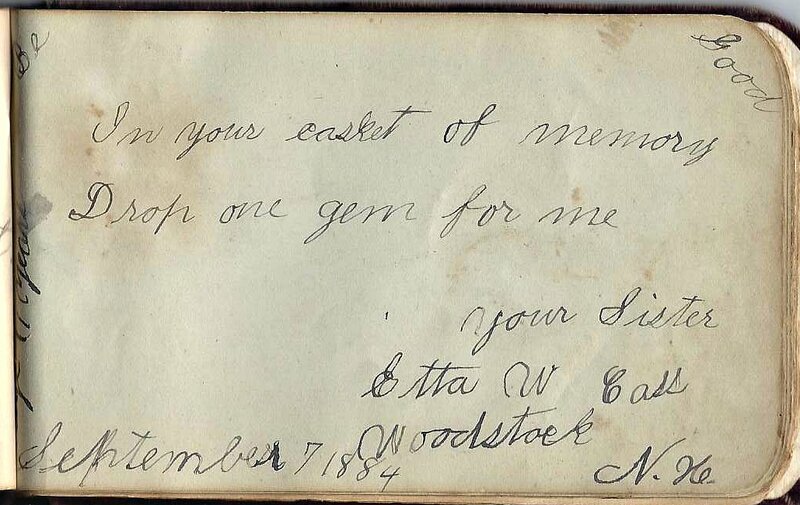 Mattie's sister Etta Wealthy Cass signed a page as Etta W. Cass of Woodstock, New Hampshire, in 1884. On 31 December 1891 at Cambridge, Massachusetts, Mattie married Alonzo Hugh Sutherland, son of William and Melinda (Rood) Sutherland. He was born 1 September 1868 [or 1869] at Wine Harbor, Port Hilford, in Guysborough County, Nova Scotia, and made his way to Massachusetts in the 1880s. Alonzo served for many years as superintendent of the Westford Water Company and also held the positions of fire chief and police officer. He and Mattie raised four children at Westford: Beatrice M. Sutherland; Lillian E. Sutherland; Alfred Alonzo Sutherland; and Bertram W. Sutherland. 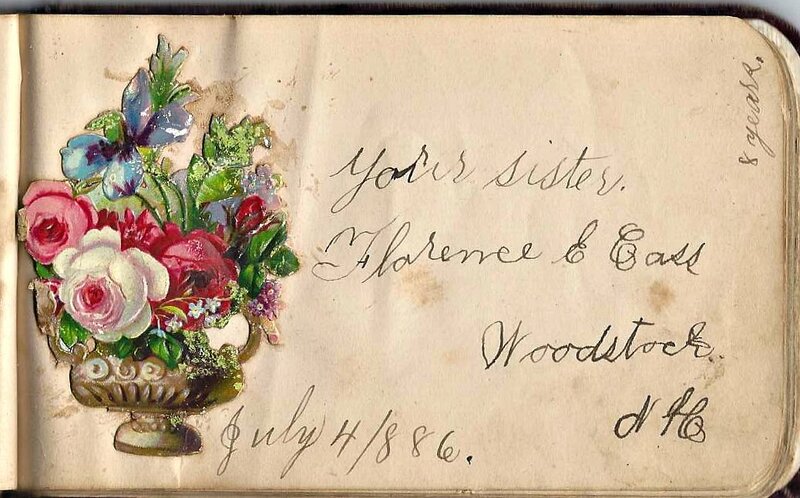 Alice E. Sawyer signed a page at Woodstock, New Hampshire, in 1887 and indicated she was Mattie's cousin. Alice was the daughter of Sylvestus Sawyer, who was a brother to Mary Ann (Sawyer) Cass, Mattie's mother. 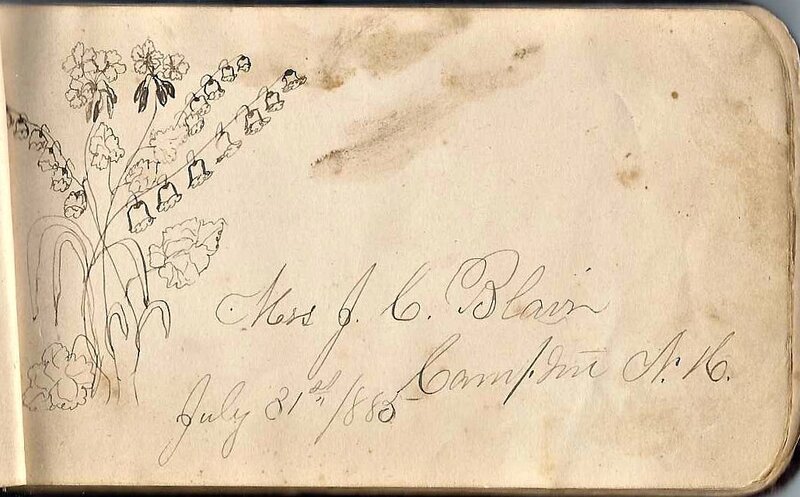 Miss J. C. Blair of Campton, New Hampshire, signed a page and sketched some flowers in 1885. If you have corrections to the information above, or insights into the Cass and Sutherland families or any of the signers listed below, please leave a comment or contact me directly. Thanks! Annie E. Abbott of Thornton, New Hampshire, 1886. 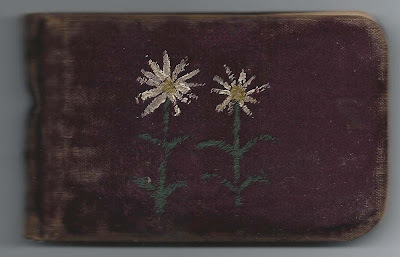 "Married 1891"
Nettie M. Blake of Plymouth, New Hampshire, signed at Woodstock, New Hampshire, 1884. "Married 1886"
Charlie S. Butler of North Woodstock, New Hampshire, 1886. A. F. Dearborn of Woodstock, New Hampshire, 1886. "Married year 1887"
Margie Dearborn of Woodstock, New Hampshire, 1886. "Married 1891"
S. W. Doyle "Married 1887"
Charles B. 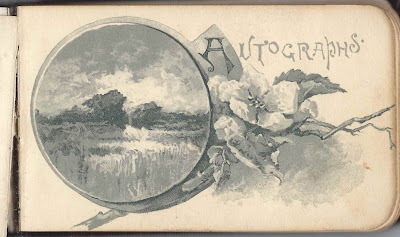 Frost of Roslindale, Boston, Massachusetts, 1886. "Married 1890"
Myra Grindell of Boston, Massachusetts. Mentions being roommates at B. Y. W. C. Assn. Boston YWCA? Sadie A. Hill of Charlestown, 1888. "Married 1889." 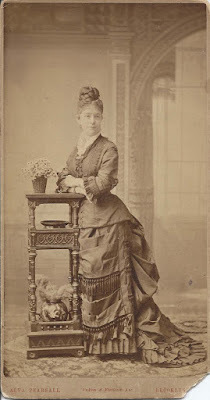 Mabel J. Howland of North Woodstock, New Hampshire, 1885. "Married 1886"
Annie B. Jackman, signed at Woodstock, New Hampshire, 1884. 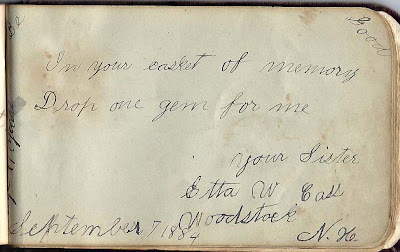 "Married 8/88"
Mollie E. Moulton of West Campton, New Hampshire, signed at Sanborn's Hotel, 1884. "Married 1885"
Irvine B. Murdock of Woodstock, New Hampshire, 1884. 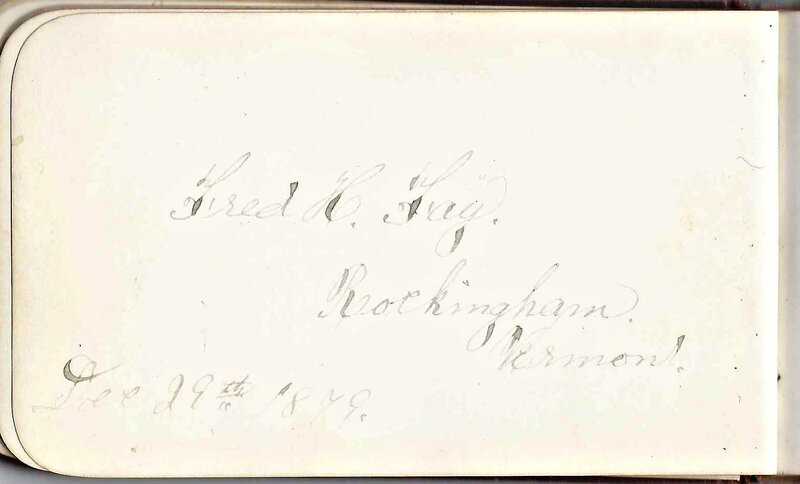 [Not sure of first name] "Married 1888"
Ardelle S. Page of Campton, New Hampshire. "Married 1885"
Mabel V. Shaw of Tilton, New Hampshire, 1885. "Married '86. Died '87"
Annie A. Shaw of East Andover, New Hampshire. "Married Christmas 1885"
Nellie F. Smith of North Woodstock, New Hampshire, 1887. 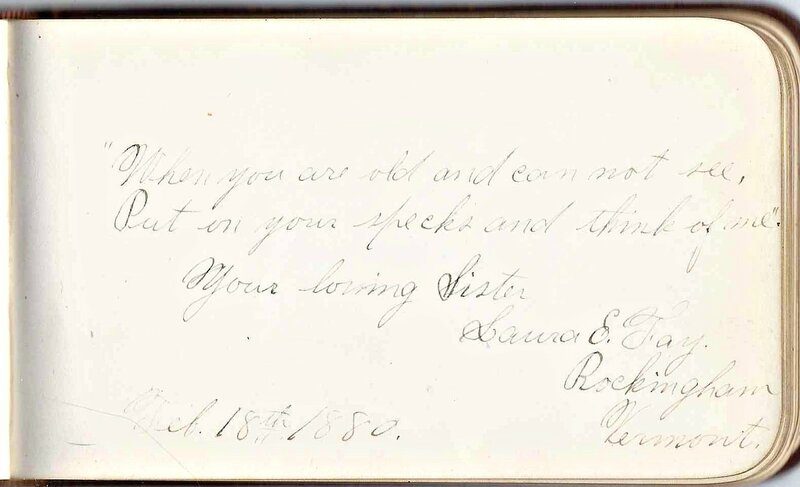 "Married year 1887"
Ada Smith, signed at Woodstock, New Hampshire, 1887. "Married 1892"
Susie Smith, 1885; friend. "Married 1886"
Minnie E. Young of West Campton, New Hampshire, 1884. 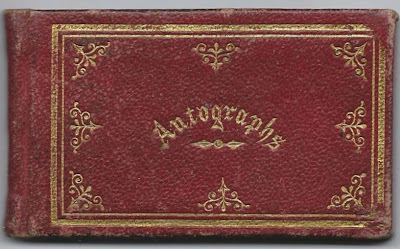 "Married year 1885"
1870s/1880s autograph album that I believe belonged to one of two brothers surnamed Fay of New Hampshire and Vermont. 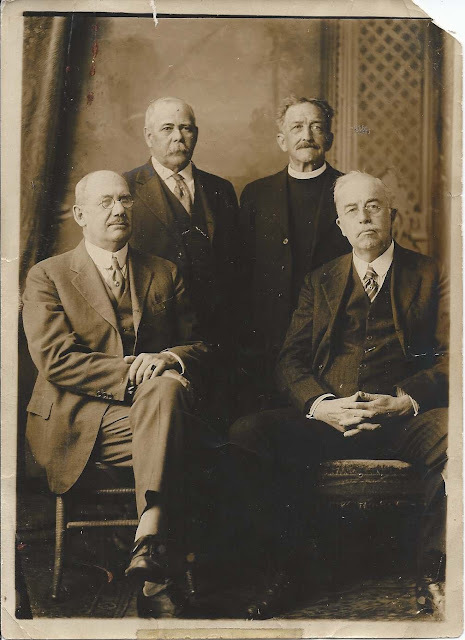 The likely brothers were Harvey G. Fay or Martin Kidder Fay. I'm leaning toward the former. 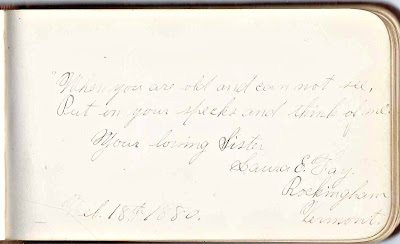 The brothers were born at Alstead, New Hampshire, but were living at Rockingham, Vermont, at the time of the 1870 Census, and at Keene, New Hampshire, by the time of the 1880 Census. 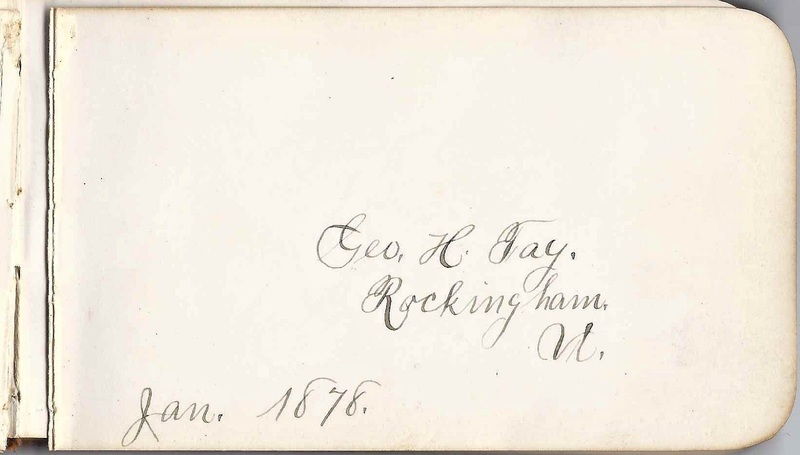 The fact that Laura E. Fay of Rockingham, Vermont, signed a page and indicated she was the album owner's sister. The approximate ages of several signers who indicated they were schoolmates, including at Pine Hill Seminary at Bellows Falls, Vermont. 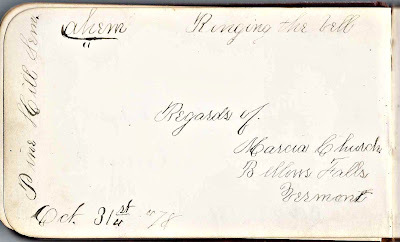 For example, Marcia Church of Bellows Falls, Vermont, who signed a page in 1878. 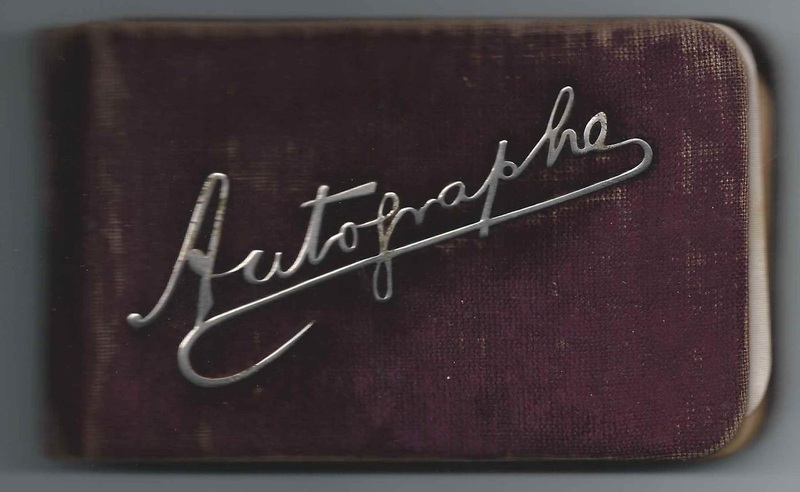 The album is approximately 5" x 3" and contains over 40 pages signed by relatives and friends. An alphabetical list of the signers appears at the end of this post. Harvey G. Fay and Martin Kidder Fay were the sons of Gerould Eardley Fay and Adaline Julia (Livermore) Fay, who were born at Alstead, New Hampshire, and Livermore, New Hampshire, respectively. Harvey G. Fay was born 6 January 1865 at Alstead, New Hampshire. He married Mae Irene Dunbar on 12 October 1891. Martin Kidder Fay was born 17 June 1868 at Alstead, New Hampshire. He married Gertrude Hinsdell on 5 June 1891 at Elgin, Illinois. 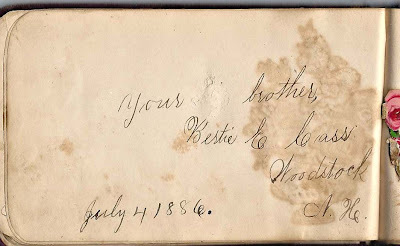 In addition to the page signed by sibling Laura E. Fay, the following pages were signed, I believe, by older brothers of the album owner. Fred H. Fay of Rockingham, Vermont, signed a page in 1879. 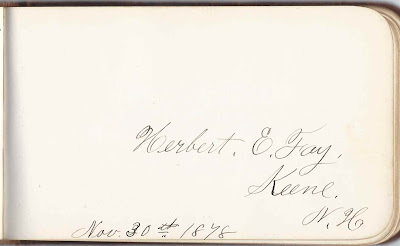 Herbert E. Fay of Keene, New Hampshire, signed a page in 1878. 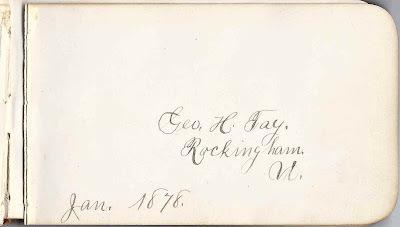 George H. Fay of Rockingham, Vermont, signed a page in 1878. 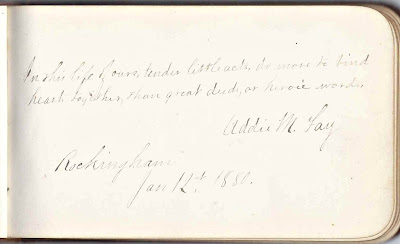 Addie M. Fay signed a page at Rockingham, Vermont, in 1880. She may have been Addie (Cutler) Fay, wife of the album owner's brother Frederick H. Fay (see his page above). If you have corrections to the information above or additional information on the Fay and Livermore families or on any of the signers listed below, please leave a comment or contact me directly. Thanks! 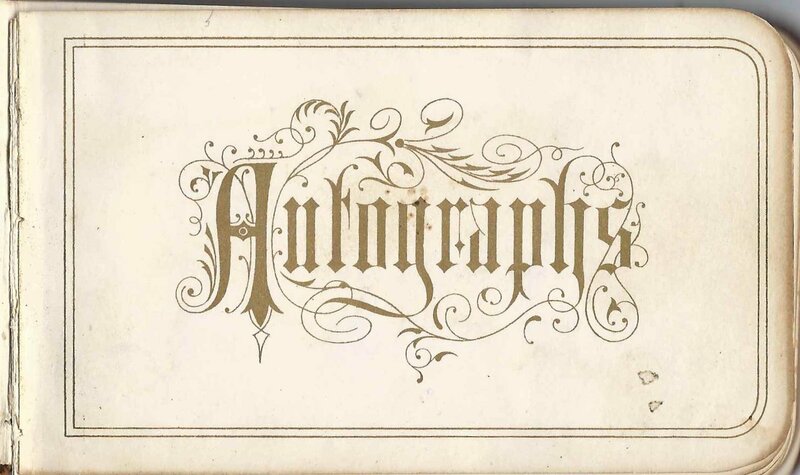 Complete list of signers, in alphabetical order: [Note: given names within a specific surname may not be in alpha order. 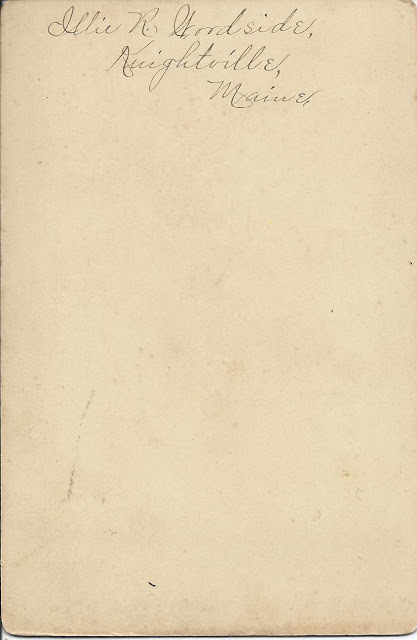 Mary E. Halpine of Keene, New Hampshire, 1881. 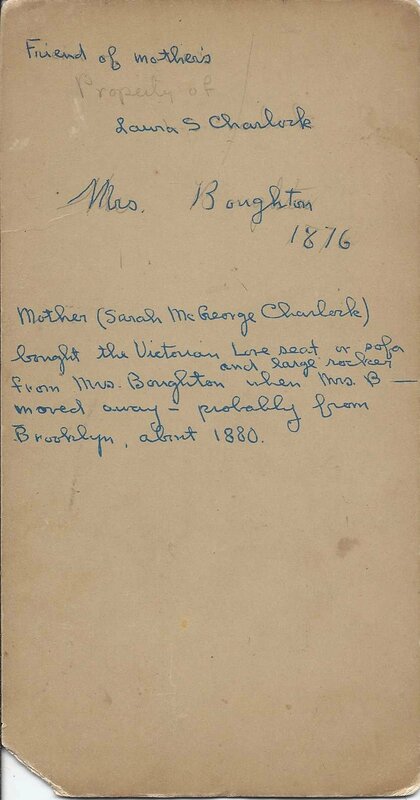 In 1885 she would become wife of album owner's older brother George H. Fay, who also signed a page. J. Elizabeth Kingsbury of Keene, New Hampshire, 1881. 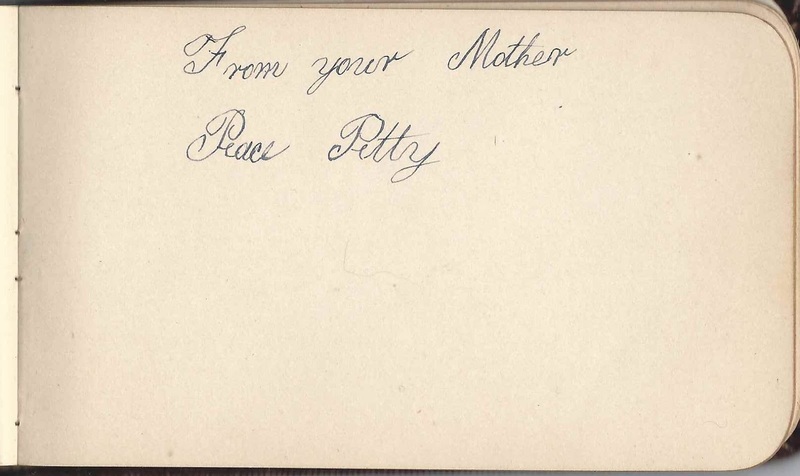 Probably Juliette E. Kingsbury, sister of Mary A. Halpine, who also signed a page. Willie T. Russell of Bellows Falls, Vermont, 1878. Willard T. Russell perhaps? 1880s/1890s autograph album that belonged, I suspect, to Meribah Gifford (Mosher) Pettey of Westport, Massachusetts. My guess is based on the facts that one of the signers, Lottie A. Bly called herself the owner's sister. I believe she was Charlotte A. 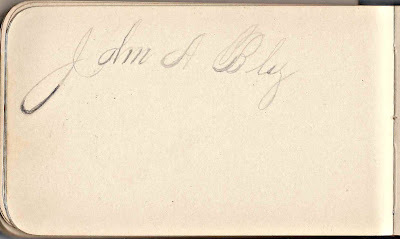 (Mosher) Bly of North Westport, Massachusetts, married to John A. Bly, who also signed a page. Lottie's sister Meribah Gifford Mosher married Eli Franklin Petty, whose mother was Peace (Tripp) Pettey. One of the signers, Peace Petty [Pettey?] called herself the owner's mother; hopefully she was actually the owner's mother-in-law. 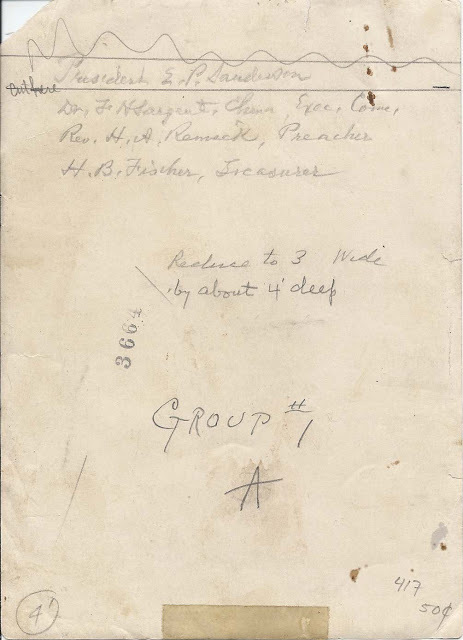 The album is approximately 5-1/4" x 3-1/4" and contains 36 pages signed by relatives and friends. An alphabetized list of signers appears at the end of this post. 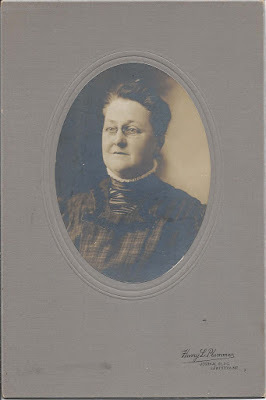 Meribah Gifford Mosher was born about February 1857, the daughter of Benjamin Franklin Mosher and Charity Vaughn (Benson) Mosher, who were born at Westport, Massachusetts and Rochester, Massachusetts, respectively. Her paternal grandparents were George and Phoebe (Brownell) Mosher. Her maternal grandparents were Jabez and Celestia (Hammond) Benson. On 14 February 1890 at Westport, Massachusetts, Meribah Gifford (Mosher) Pettey married Eli Franklin Pettey, son of Pardon and Peace (Tripp) Pettey. He was born 27 October 1855 at Westport, Massachusetts. 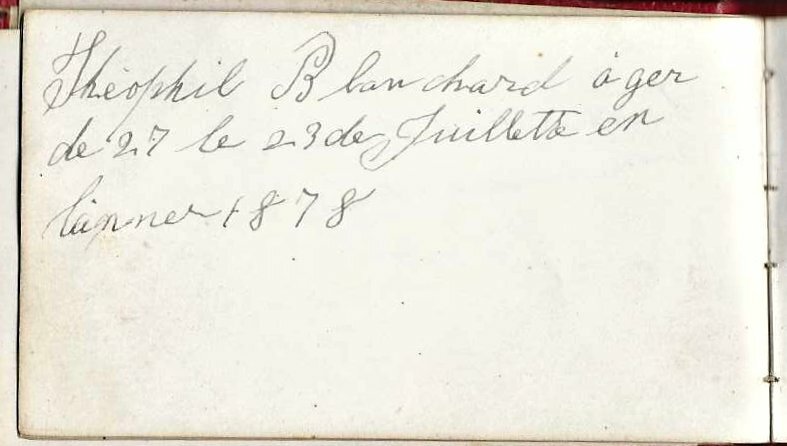 Eli signed the page shown below in 1886, before their marriage. The couple had a daughter Helen May Pettey, born 18 June 1898 at Westport, Massachusetts. Sadly, she died on the day of her birth. Meribah Gifford (Mosher) Pettey died in 1907 at Westport, Massachusetts. If you have corrections to the information above, especially if you think the album belonged to someone other than Meribah Gifford (Mosher) Pettey, or information on any of the signers listed below, please leave a comment or contact me directly. Thanks! John A. Bly, husband of Meribah's younger sister Charlotte A. Mosher, who also signed a page. 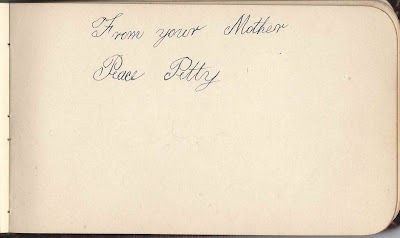 "From your Mother, Peace Petty" [Pettey? ]; May's mother-in-law Peace (Tripp) Pettey, mother of her husband Eli Frank Pettey. F. W. Richardson of Fall River, Massachusetts, 1893.